Good morning. I'm pleased to join you today for the Hong Kong Green Finance Forum and the launch of the Hong Kong Green Finance Association. I would say that both the Forum and the launch of the Association are most timely, as Hong Kong is on the road to develop into a hub for green finance. Coincidentally, coming to this landmark event this morning reminds me of something I have done exactly 10 years ago, and that is to support and facilitate the setting up of the Hong Kong Green Building Council. I am sure that there could be a lot of synergy between the Hong Kong Green Building Council, which is tasked to ensure energy efficiency in our built environment, with the Hong Kong Green Finance Association. If you need any help from me, Dr Ma, I am happy to be the connector. It is not only about Hong Kong's development, but will also contribute to the development of our country. In his report delivered at the 19th National Congress in October last year, President Xi Jinping outlined the plan to speed up reform of the system for developing an ecological civilisation. He made it clear that the country will promote green development. In particular, the country will create a market-based system for green technology innovation, develop green finance, and spur the development of energy-saving and environmental protection industries as well as clean production and clean energy industries. The country's initiatives will create strong demand for green funding. Being China's international financial centre, Hong Kong is well positioned to offer the needed financial services, and capture the opportunities arising from it. There is also a global dimension. The world made an important step forward with the 2015 Paris Agreement, adopted by 195 countries, which is also applicable to Hong Kong. The goals of the Paris Agreement, which include a two-degree limit on world temperature increases, are estimated to cost nearly US$7 trillion a year globally between 2016 and 2030. Governments alone can hardly hope to raise such sums. Which is why, in 2016, green finance was included for the first time on the agenda of the G20 Summit held in Hangzhou. The strong demands for green funding and for green investment opportunities have led to the exponential growth in global green finance. In particular, the international green bond market has been flourishing. Governments, multilateral development banks and public entities worldwide have turned to green bond issuances. Indeed, the global aligned green bond issuance for the first half of this year rose 9 per cent, year-on-year, to about US$77 billion. Of that, Mainland China represented 12 per cent, up an encouraging 14 per cent over the same period the previous year. Hong Kong is ready to join the great green wave. Subject to the authorisation of our legislature, my Government will launch a green bond issuance programme with a borrowing ceiling of HK$100 billion, making it among the largest sovereign green bond issuance programmes in the world. In addition, we have launched the Green Bond Grant Scheme, which subsidises the costs issuers incur in obtaining certification under our Green Finance Certification Scheme. We have also put in place an enhanced Qualifying Debt Instrument scheme to spur market demand. It offers tax concessions for bond investment in Hong Kong. I'm pleased to say that we're doing a bang-up business in bonds. In the first half of this year, 15 green bonds were issued here. Their aggregate size of US$8 billion comes courtesy of a multitude of issuers, including multilateral agencies and private entities from around the world. Our green finance profile is also looking good internationally. Hong Kong is a founding member centre of the G7-supported International Network of Financial Centres for Sustainability. The Network was launched last year and is a partnership between financial centres and the United Nations Environment Programme to exchange experience and take common action on shared priorities, with a view to accelerating the expansion of green and sustainable finance. 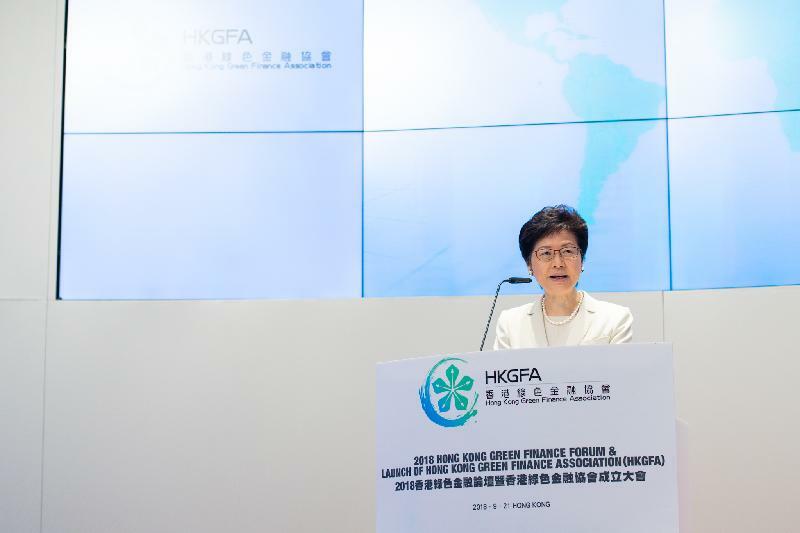 In June, the Hong Kong Monetary Authority, in collaboration with the International Capital Market Association and the People's Bank of China, held two events on green bonds which gathered a total of 1 300 industry professionals and policymakers. Our Securities and Futures Commission and Hong Kong Exchanges and Clearing Limited have also been active in the global green finance scene, promoting market development through such initiatives as the United Nations Sustainable Stock Exchanges. As Hong Kong is building momentum on green finance, we are glad to see the proactive initiative from over 90 market practitioners and business front-runners in launching the Hong Kong Green Finance Association. 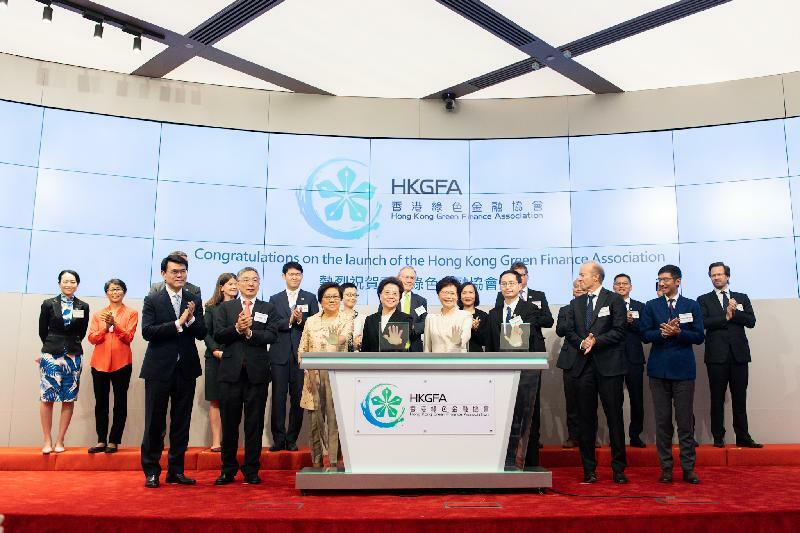 Indeed, the establishment of the Association marks another milestone in the development of Hong Kong as a green finance hub. It signifies the depth of our market for green finance and industry's commitment to putting Hong Kong on the world map as a green finance capital. Rest assured, my Government will support the Association and other local professional bodies in their work, including in their collaboration with overseas counterparts in the promotion of green finance. I wish the Association every success in the sustainable future. And I wish you all a very rewarding Forum today. Thank you very much.